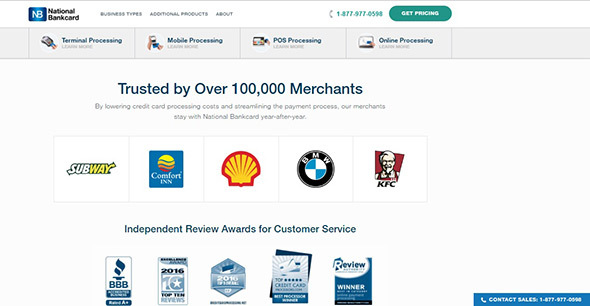 Used and trusted by more than 100,000 merchants nationwide, National Bankcard boasts a client base of huge brands such as Shell, KFC, Subway, and Comfort Inn. But don’t let that make you believe they only deal with giant corporations. National Bankcard also offers extremely attractive interchange plus or tiered pricing alongside their highly feature-packed services for mid-sized and smaller businesses. Prospective merchants can get set up in as little as 24 hours with a point of sale system that best suits their business’ needs. Their POS services are highly flexible and work in a variety of direct, mobile, and online environments-enabling businesses to quickly process orders and payments with no waiting time. In fact, according to their website, transactions can be processed in as little as 1-5 seconds! There’s no small wonder that it’s a popular choice for discerning businesses can claim they provide wholesale processing prices-and National Bankcard is one of them. This is where National Bankcard stands out: they’ve partnered with 4 different point of sale providers to match merchants up with their perfect system, dependent on their business’ unique operations. The third parties, such as ShopKeep and Clover supply the software, while National Bankcard handles hardware, processing and payments. Now while this might sound like it makes things more difficult, this is super beneficial for merchants. As the appointed go-between, National Bankcard is able to negotiate “wholesale rates” for its clients. Something which is tricky, if not impossible to do if you’re facing a POS system one-on-one. To step up their game and strengthen their image, we’d strongly recommend that National Bankcard expand their customer services. Providing some instantly-accessible and quick to read articles or posts on their website would be a great start, as would even a simple FAQ page. A live chat system would also be great, as it can easily help direct merchants to troubleshooting articles. Often, clients’ issues with their POS systems are simple, straightforward, and take little to no time to fix. If there is enough “How To” information available, merchants can often fix minor problems themselves without needing to engage a live representative. And merchants know that there’s nothing more difficult than having one ear glued to a phone, waiting to get assistance, while simultaneously serving in-store customers. That said, it has been reported that their customer service representatives are superbly trained, and are extremely capable and efficient-as well as friendly. In addition, merchants are often assigned a specific account manager to whom they can always turn for help. But by providing additional customer support, National Bankcard could certainly become one of the strongest POS contenders. 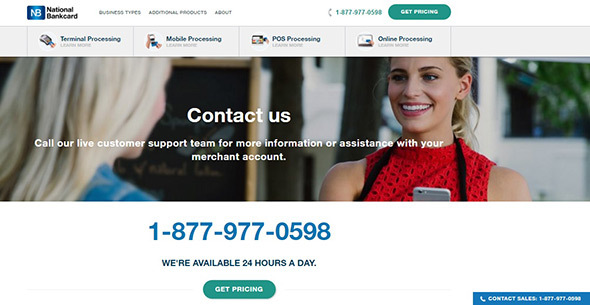 They openly declare that they do not require any setup or cancellation fees, which is refreshing as companies have tried in the past to sneak in additional fees when opening or closing a merchant account. However, detailed information about what’s included in their plans-and how much they cost-is lacking. Prospective merchants must contact a National Bankcard representative in order to obtain these figures, and we would strongly recommend asking for any quoted prices in writing. However it has been reported that they offer both Tiered and Interchange Plus pricing plans that start from as little as 0.25% for a swipe or chip dip payment, to 1.99% for keyed-in transactions. National Bankcard proves here that it matches the modern merchant’s expectations by offering month to month contracts-the ultimate flexible option for businesses on the grow. They also proudly declare that they do not charge any setup or cancellation fees, something which is practically an industry standard nowadays. Yet what we’d like to see is more information regarding other possible fees and charges that may crop up from time to time. Additional gateway or PCI compliance fees, account administration charges, statement, chargeback and virtual terminal setup fees are all gray areas that need to be spelled out more clearly so that prospective customers can get a better picture of what their statements will look like at the end of the month. ​Founded in 2007, National Bankcard’s main office is located in Melville, New York. Their current CEO is Mr. Jonathan Monge.